Our philosophy is based on CREATIVITY, INNOVATION, FUN, COLORS and, above all, PERSONALITY! Our mission is to let our customers express their distinctive style through colorful, trendy and original products. Fashion doesn’t mean for us that everybody has to wear the same things! We respect differences and we believe that each person has a unique personality that deserve unique accessories! The diverse collection of watch skins includes several fresh and trendy designs to match any look: stylish, urban, romantic, ethnic, chic etc. With so many styles to choose from your watch can be different every day! With the wide range of designs, Popochos are loved by all ages. Whatever the time of day or situation, there is always a Popochos matching your moment. We adore what we do and we listen to what our fans have to say in order to give them the best accessories. We are constantly exploring new territories and developing new ideas! SAFETY AND QUALITY: OUR MUST! 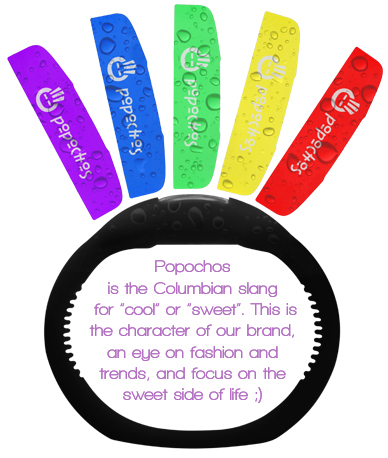 Popochos has quickly become a worldwide known brand thanks to creativity and quality of the products. We proudly produce the watch skins in Italy using only CERTIFIED MATERIALS because we value your safety! Do not trust imitations, buy only genuine Popochos!